As rumored, The iPad Retina Mini is now officially available to purchase via the Online Apple Store. Ship times are 1-3 business days for the 16GB and 32GB Wi-Fi models and 5-10 business days for the 64GB, 128GB, and all cellular models. In-store pick-up is an available option for some models as well. You can purchase the device in United States, Canada, Australia, China (Wi-Fi models only), Hong Kong, Japan, New Zealand, Spain, and Singapore. iPad mini with Retina display Wi-Fi models are available for a suggested retail price of $399 (US) for the 16GB model, $499 (US) for the 32GB model, $599 (US) for the 64GB model and $699 (US) for the 128GB model. iPad mini with Retina display Wi-Fi + Cellular models are available for a suggested retail price of $529 (US) for the 16GB model, $629 (US) for the 32GB model, $729 (US) for the 64GB model and $829 (US) for the 128GB model. 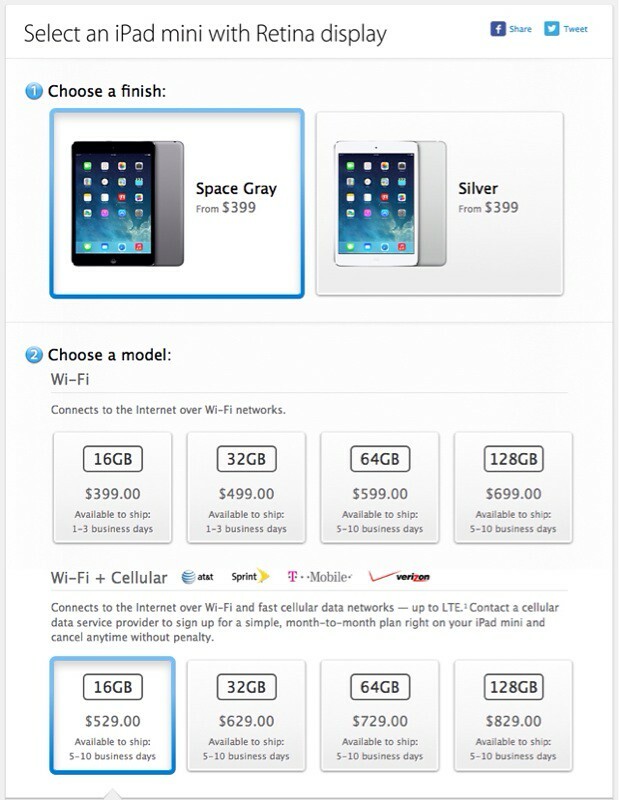 Additionally, the original iPad mini is now offered at a lower price of $299 (US) for the 16GB Wi-Fi model and $429 (US) for the 16GB Wi-Fi + Cellular model for either AT&T, Sprint or Verizon. How Long Do Hard Drives Last?